This latest Wentworth vintage wedding had such a pretty and unusual colour scheme, and it looked amazing not only against the bridesmaids dresses but also under the stunning downlighters in the Wentworth ballroom. 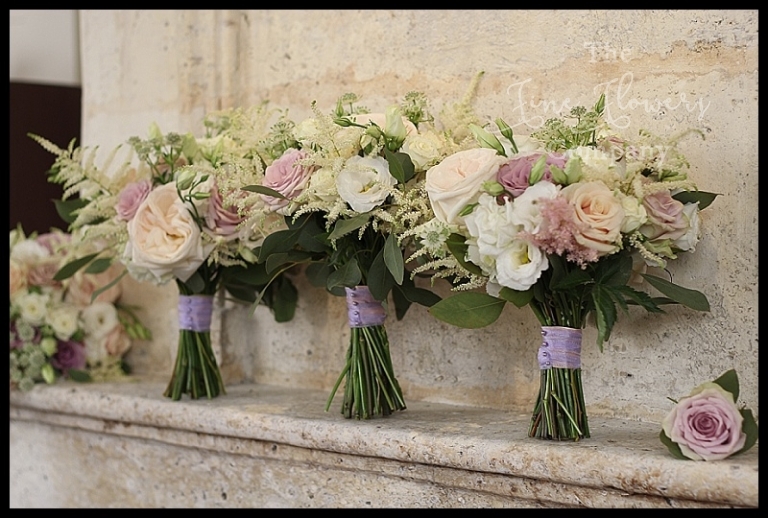 For her and her bridesmaids bouquets Ali chose a beautiful soft mix of O’Hara roses, Pacific Blue, Memory Lane, Mentha and Vendella roses, with touches of wilder and more informal flowers such as astilbe, astrantia and lisianthus. The men’s buttonholes were all Memory Lane ones apart from the groom who wore a cream rose buttonhole. For this beautiful Wentworth vintage wedding, we created stunning centrepieces of hydrangeas, roses, astilbe, astrantia and lisianthus, with scented herbs and eucalyptus bursting with texture and blending some delicious vintage shades. To echo the tall ceiling in the Ballroom, we mixed mainly tall displays using our vintage silver tall stands, and we mixed in a few low Revere rose bowl centrepieces to break things up a bit and add even more interest. The soft colours worked beautifully with the darker purple sheer organza chair sashes! Finally, the balcony overlooking the guests reception area, was styled with wild style ivy and foliage with accent flower posies in vintage hanging vases. 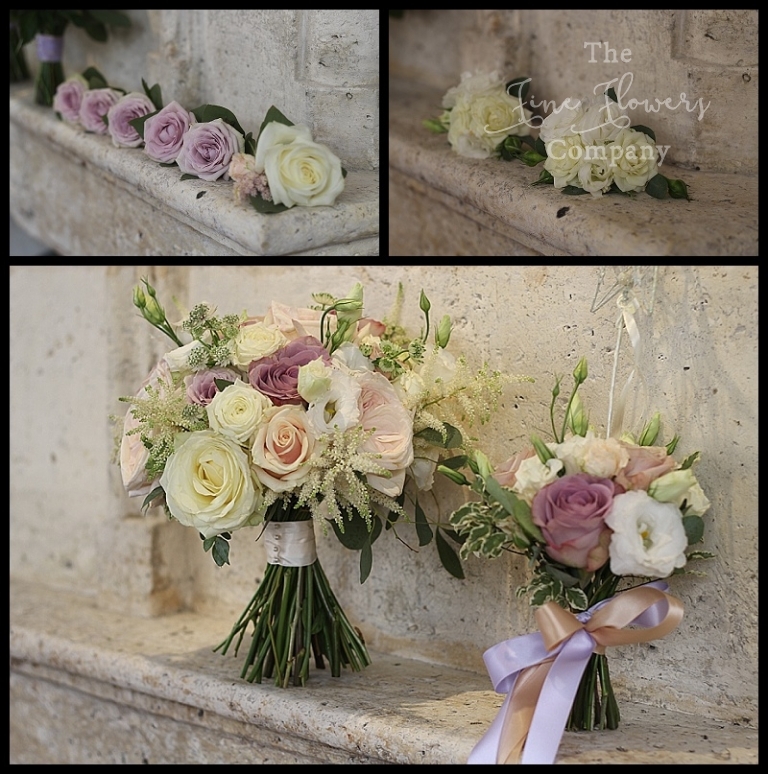 Here are some more shots of these very pretty Wentworth vintage wedding flowers to get you started. 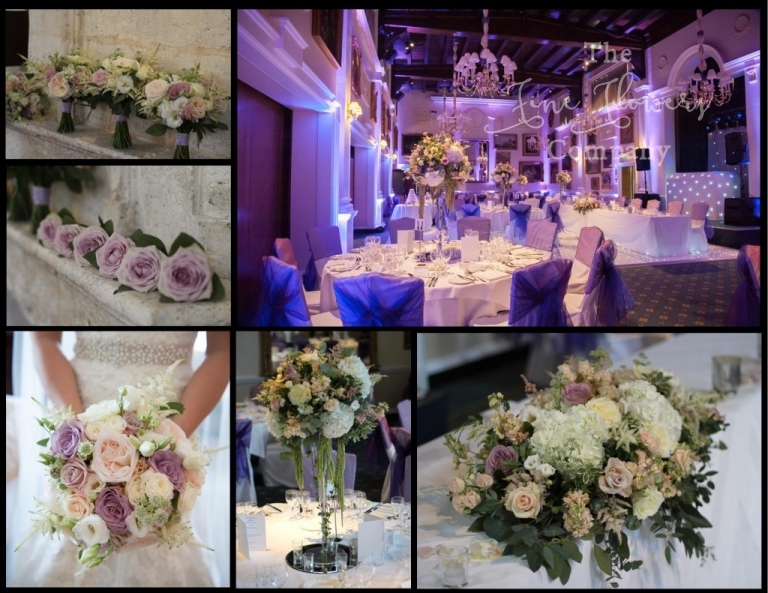 If you are still looking of a local florist for your Wentworth wedding, please take more inspiration from our other featured Wentworth Golf Club venue pages. We are very familiar with this stunning venue having styled many weddings here, and can make it even more amazing!! !